This post is similar to the Part II and III posts. This post includes even more clippings from around the country. Bittersweet is the adjective here. Bitter (or wistfully reminiscent): so many of those 1976 Rolfe residents have since passed away. 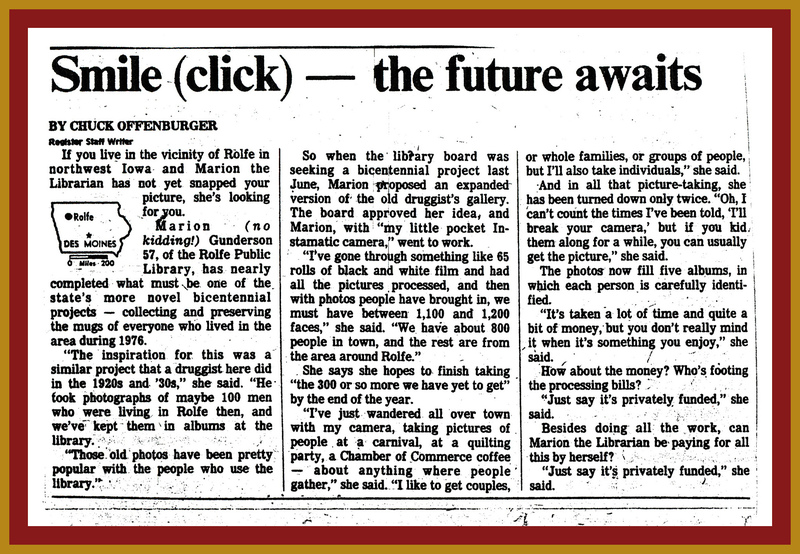 Sweet: the photos are at the library and help us refresh our memories and honor those 1976 residents of Rolfe. If you haven’t looked at Part I, Part II and Part III, I hope you will. Part I tells about the overall 1976 project. Part II, and Part III (as well as this post) include clippings and notes from around the country about the 1976 project. News of the project spread like wildfire across the United States once the Associated Press picked up the story. 1) Click on any thumbnail below [or in Part II and Part III] to enlarge it and to see the images in slide show view. 3) To enlarge even more, hover the mouse over the image to see a “+” sign. When you see that plus sign, click on the image and it will magnify even further. This entry was posted on March 24, 2013 at 2:08 pm and is filed under Iowa, Marion Gunderson, Rolfe. You can follow any responses to this entry through the RSS 2.0 feed. You can skip to the end and leave a response. Pinging is currently not allowed. Thanks for posting instructions on how to make the images larger. I’m glad to be able to read the newspaper articles and notes. Thank you, Clara. I stumbled across the clippings at the Rolfe Public Library not long ago. I don’t know if I ever even knew they existed. There’s so much of my own stuff that I throw away thinking I’ll never need/want it. I’m certainly glad these people 1) sent the clippings to Mother and/or the library and 2) that there was foresight to compile the clippings and preserve them.